Dehumidifiers remove moisture from the air to regulate humidity levels in homes and businesses. They are generally portable units designed to serve a single room or area. A proper humidity level in your home will reduce the likelihood of mold growth, cut down on odors and allergens for your family and pets and even reduce damage to woodwork, furniture, drywall and paint. It's extremely important that your unit's humidistat is set to the proper humidity level. If you set the humidistat at a humidity level too low, the dehumidifier may run continuously. This wastes energy, resulting in higher electric bills and may have a detrimental impact on your home or business' air quality. Most homes and businesses need some humidity to prevent drying-out damage to wood and paint as well as to control static electricity. Extreme dryness may also result in chapped lips and skin, bloody noses, respiratory problems and general discomfort for people and pets. This handy, battery-powered hygrometer/thermometer can be mounted to a wall or set up on a table. It displays humidity levels and room temperature so that you can check to see if your dehumidifier is functioning properly and maintaining the humidity level as set on its humidistat. To prevent the growth of mold, your dehumidifier's condensate (water) bucket should be cleaned monthly or as frequently as needed. Power off and unplug the unit, remove the container and wash it with warm water and a small amount of dish detergent. Rinse and dry the container thoroughly before returning the container to the dehumidifier. If odor is present after cleaning the container, try these odor-eliminating tablets that dissolve in water. 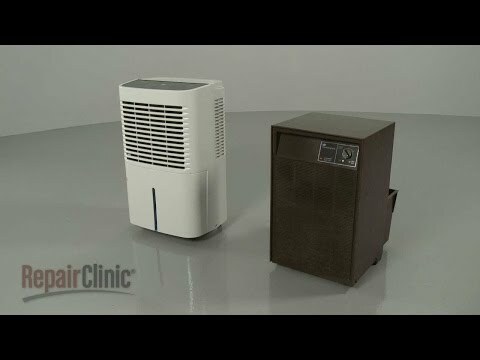 Your dehumidifier may have a simple, electrostatic air filter located in its grill area. Twice per year, check this filter for tears or other damage. Replace if any damage is found. Some filters may be cleaned; others require replacement. Check your unit's owner's manual for specific instructions about filter care. Enter your dehumidifier's model number to find replacement filters designed for your model. If the temperature in the room falls below 60 degrees Fahrenheit (15 degrees Celsius), your dehumidifier's evaporator coils may develop ice buildup. This may lead to an expensive repair. Dehumidifiers should only be used in rooms that are kept above 60 degrees Fahrenheit (15 degrees Celsius). You may find that raising the dehumidifier up off the ground will help, as room temperature tends to be coolest near the floor. This will prolong the life of your dehumidifier by preventing compressor short cycling and enabling pressure in the refrigeration system to equalize properly. Dehumidifiers have a cooling system that refrigerates the air entering the unit. The moisture in the air condenses on the cold coils and then deposits into a removable container (a.k.a. water container, water tank or water reservoir) located at the bottom of the unit. The cold air is then passed over a warm set of coils, which warms the now-dry air back to its original temperature. Most homes and businesses in humid climates can benefit from the use of a dehumidifier. There are some obvious signs, too. Symptoms of excessive humidity include moisture marks on walls and ceilings, warped or damaged wood (wood swells in high humidity conditions) peeling wallpaper, blistered ceilings, creaky floors, sticking doors and cabinets, musty odors and mold growth. Of greater concern may be symptoms of mold and mildew allergies. This depends entirely on the humidity level in your home or business. Monitor water levels in the container to determine how frequently you'll need to empty and clean your dehumidifier's water container. Portable dehumidifiers are available in a variety of moisture-removal capacities (usually identified as pints of water removal daily), to accommodate small or large spaces. There are also whole-house units available. Learn more about newer models in reports published by credible media such as Consumer Reports. The expected life of your dehumidifier will depend on usage and maintenance. In general, they last about six to nine years.